Luke Cage premiered on Net ix on Sept. 30, 2016. Mike Colter’s portrayal of Luke Cage is a anoth- er subtle demonstration against social injustice. Marvel has really stepped up their game in the last few years. Aside from movies, Marvel has been taking Netflix by storm with its shows “Jessica Jones” and “Daredevil.” Both set new standards for superhero shows with mature themes. That’s where the new series “Luke Cage” comes into play. “Luke Cage” tells the story of a man with superhuman abilities in Harlem, N.Y. Played by Mike Colter, Cage loves the community and the community loves him. Harlem is being destroyed by a gangster known as Cottonmouth, played by Mahershala Ali. Cottonmouth’s cousin, played by Alfre Woodard, is a councilwoman trying to rebuild Harlem. However, she’s been under scrutiny for her connections to Cottonmouth. Cage is framed for murder and has to figure out who set him up while trying to save Harlem from the gangsters. Rosario Dawson is also in the show, reprising her role as Claire Temple, from “Jessica Jones” and “Daredevil.” Dawson and Colter have an amazing chemistry. What I love about the Luke Cage character is that he may be virtually indestructable on the outside but he has deep emotions and sometimes questions his own actions. He often says that nobody should have the powers that he has. What makes the show interesting is the subject matter it explores — a closer look at what many black males have been facing in their lives for years. 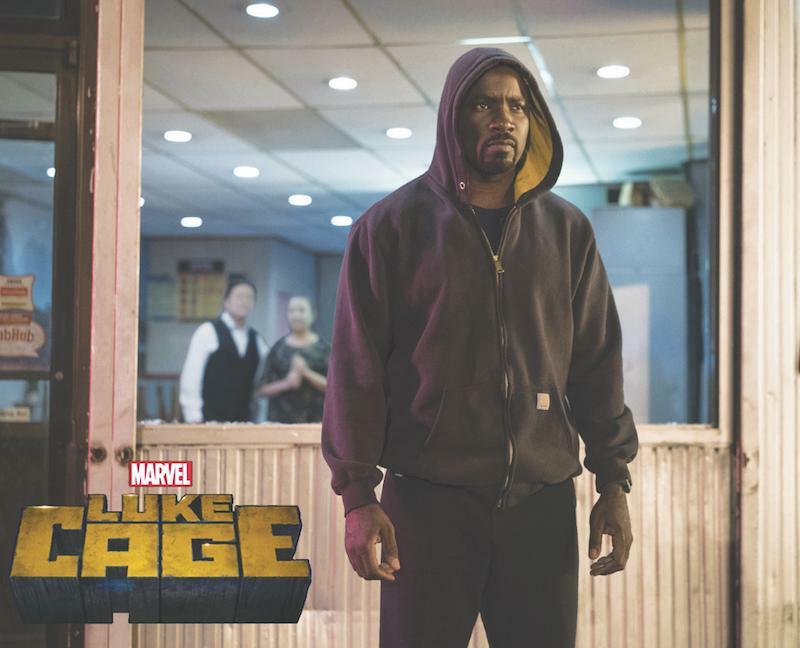 In the show Luke Cage wears a hoodie. According to Mike Colter, he’s wearing the hoodie in tribute of Trayvon Martin. There’s a scene where police stop someone just for wearing a hoodie, thinking it’s Luke Cage. Method Man of Wu Tang even has a cameo in the show and his own song about Luke Cage called “Bulletproof Love,” which talks about why police target unarmed black men. What the show does well is make Harlem itself into a character. In many ways, the area of Harlem is the main character because the show talks a lot about its history and why it’s important to African-Americans. It also talks about why some traditions must be preserved, and why certain things should not be destroyed. Harlem is essentially the main character while the gangsters living there are the antagonists. The show has some notable technical aspects. The cinematography is gorgeous, and shows another world that’s different from Hell’s Kitchen. The fight scenes are well choreographed and very entertaining. The lack of action in the show is compensated with great character development and fantastic writing. “Luke Cage” is an excellent addition to the different series Marvel has on Netflix. It’s a good introduction for the upcoming “Defenders” series, which will team Luke Cage with Jessica Jones, Daredevil, and Iron Fist (whose series is coming in 2017) to fight an evil that is plaguing New York. “Luke Cage” is a must see show.